Trying to plan a fabulous vintage chic Chicago-area wedding for 120 people on a small town budget. Can it be done, and if so, at what cost to my sanity? Tune in to find out as I sift through do-it-yourself projects (from failures to fabulous), bargain hunting and sacrifices made, all for a lifetime of memories to be made in September 2009. The Final Decision? A Piece of Cake! Should we just CHUCK it? Since I've picked such an, err, unnatural shade of green for my accent color, I've pondered different possibilities for my floral elements. 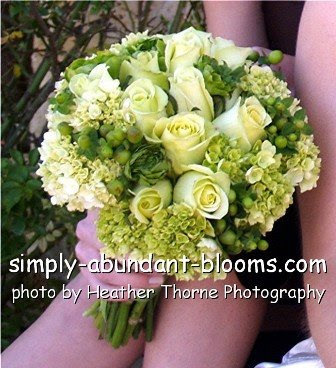 I thought it would be nice to add touches of green in the bridesmaid bouquets and the men's bouttenieres. I'd then keep my bouquet and Mr. S's boutteniere snowy white to set us apart. Since the shades of green I can get in nature tend to be either more of a lime, or a deep forest green, I've played around with different ideas. One option I came across (isn't searching via Google images fabulous?!) 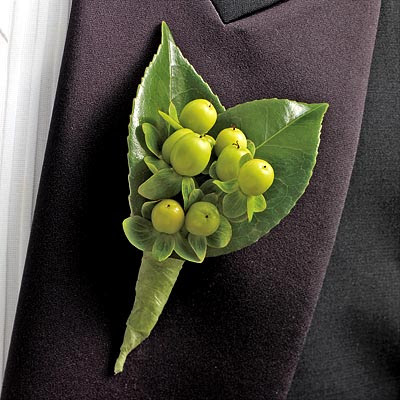 were hypericum berries. They're kind of fun and modern, while also adding a textural element that I really like. Love these bouttenieres for the guys. 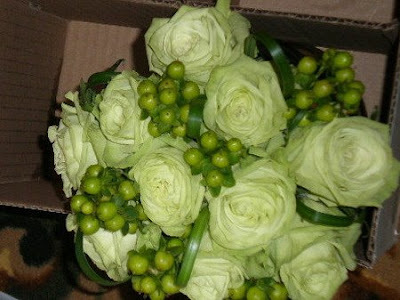 AND when I mentioned this to my florist, it brought the price quote down by a couple of bucks per bout! And with 10 bouts to buy, it definitely adds up! Hmm, this might be a bit overload of berries, but you get the idea. I really like the texture in this bouquet. While I know the ones for my girls will be smaller/less lush, I love that the overall "aura" of this bouquet leans toward the green side. Sigh. I just have to keep telling myself that no one is going to just hold the bouquets up against the bridesmaids' shoes, so the hue of what's in their hands doesn't specifically have to match what's on their feet. And I could also nix the idea completely and give everyone white. But... in the end I think the green is fun! And interesting! And why pick exactly the same flowers for them as I am for myself when I can instead have fun and add in some different blooms?! I have a few other ideas I'm tossing around for green floral options, but the berries are definitely topping the list. I really like the berries and the green you picked out. For some reason, I'm also craving Granny Smith apples. Hmm. Anyways, love the new template. Help Kate Miller Events Win the KCRA A-List Contest!